Monday 1 June, a very cold morning, the start of winter in Melbourne and art consultant, Bernadette Alibrando is giving a tour of Melbourne Central’s art for the media. Some people are surprised that Melbourne Central, a shopping centre above a train station, even has a public art collection. Another surprise is the number of street artists commissioned by the shopping centre. The tour did not look at the novelty clock (for that see my post on Melbourne’s giant novelty clocks) or the way that the old shot tower is incorporated into the glass cone architecture the central features of the centre’s main space. We started with the floating Hamish Munro sculpture, Filling the Mould that was slowly deflating after the morning rush hour. 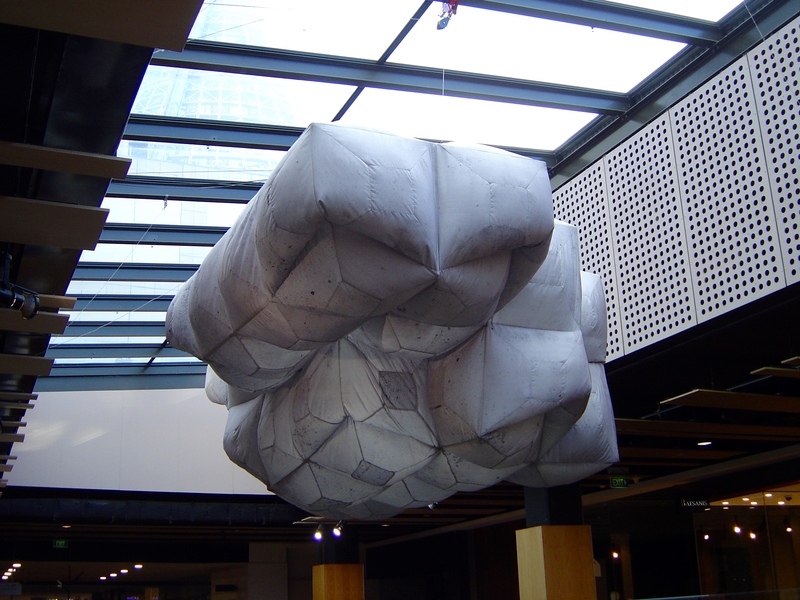 The fabric sculpture over a stair well expands and contracts relative to the number of people in the shopping centre. The grey fabric of the sculpture matches the raw concrete architecture of Melbourne’s Central’s interior. There is the huge (61m. long x 3.5m height) heritage listed mural in the Swanston Walk entrance way to the train platforms that dates back to the completion of the station in 1984. The mural is by Dr Hogg was made in collaborated with Ilma Jasper and Kay Douglas and celebrates workers in a variety of trades and industries. Dr Hogg is the Coordinator of Public Art/Art in Public Space in the School of Art and has been working with public art and murals for most of his career. Part of RMIT lightscape project at Melbourne Central from earlier in the year. The proximity of RMIT to Melbourne Central brings in RMIT lightscape project with a regular rotation of works by six students. In the food court there is a painted piano, inviting and encouraging buskers to ask permission from the shopping centre administration. Although I had seen the work before when I thought about it was surprising how many street artists have pieces in Melbourne Central. The tour took in Kaff-eine’s pillar and Kelsey Montague selfie wings. Kelsey Montague cold called Melbourne Central when she arrived in Melbourne to do this piece. The tour didn’t get to the Lucy Lucy and Slicer mural that is also in Melbourne Central. The commissioned works in the controlled environment of shopping centres by street artists known for their uncommissioned/illegal art is either a complete sell out or the obvious triumph of their style of guerrilla urban decorations. 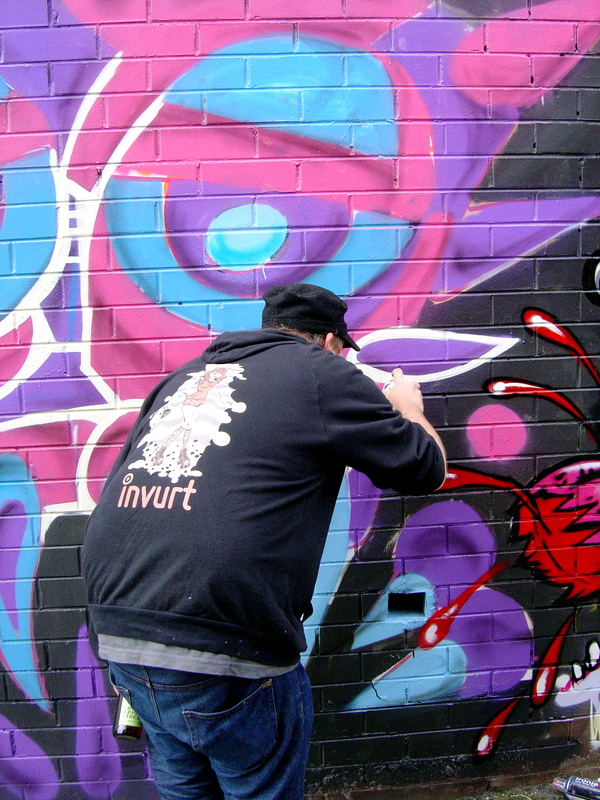 There are also works by street artists at the QV Centre and read my post about the street artists at Barkly Square in Brunswick. I am reliably informed that there is also pieces by Adnate-Sofles-Smug in Northland and Lister in Broadway Shopping Centre. That shopping centres consider street art to be the best style to present to their customers stands in contrast to the frequently seen small business owner doing vox pop complaints to the media about graffiti. It feels odd to be writing about the arts policies of shopping centres but Melbourne Central has a similar arts strategy/policy to Barkely Square with using both recognisable and popular street artists along with buskers to add local colour and atmosphere to a shopping centre’s architecture. I was going to comment that this year in street art had a bit dull… the same old same old stuff on the streets, no innovations or developments like yarn bombing or street sculpture. 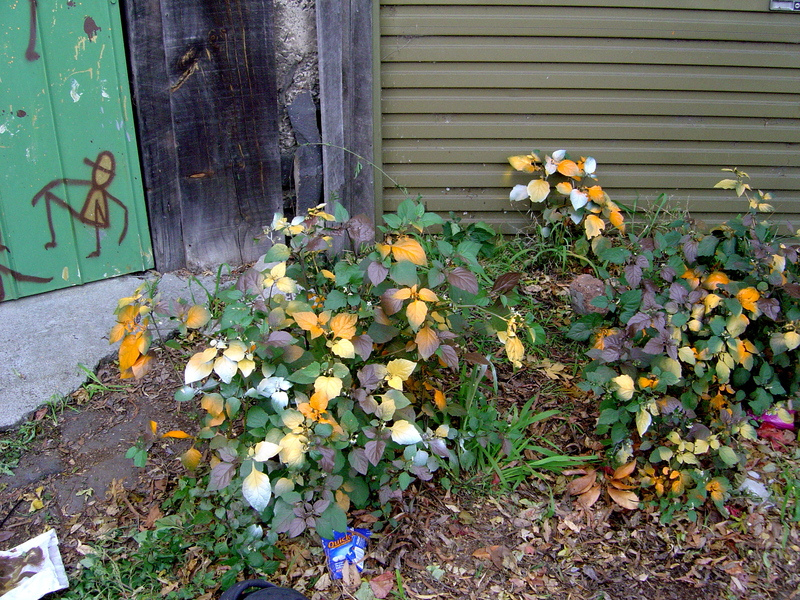 But then along came Doyle with his Empty Nursery Blue in Rutledge Lane. 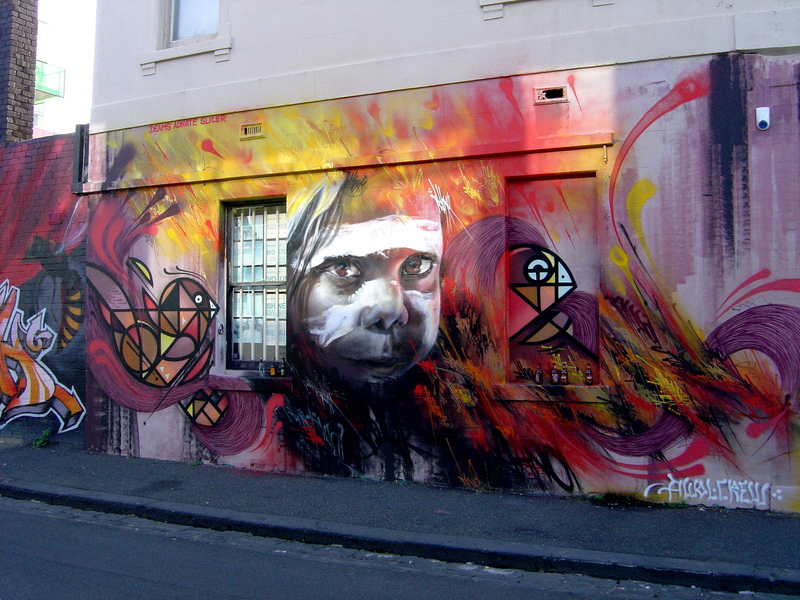 And the division between the technical and the conceptual elements in street art was brought into even sharper contrast with CDH’s article “The Commodification of Street Art” in the September issue of Art Monthly Australia and E.L.K.’s reply “The mouse that sunk the boat” on Invurt. I am used the word “technical” in the last paragraph to describe the work of artists with the technical skill of stencil cutting, aerosol spray skills, etc. in contrast to the conceptual, thinking of and executing an idea. I am using ‘conceptual’ in the way that Galenson uses it, to refer to conceptual break through from collage to video art, and not to exclusively refer to works of conceptual art; David W. Galenson contrasts modern and contemporary conceptual and experimental artists in his book Conceptual Revolutions in Twentieth-Century Art (Cambridge University Press, 2009, New York). 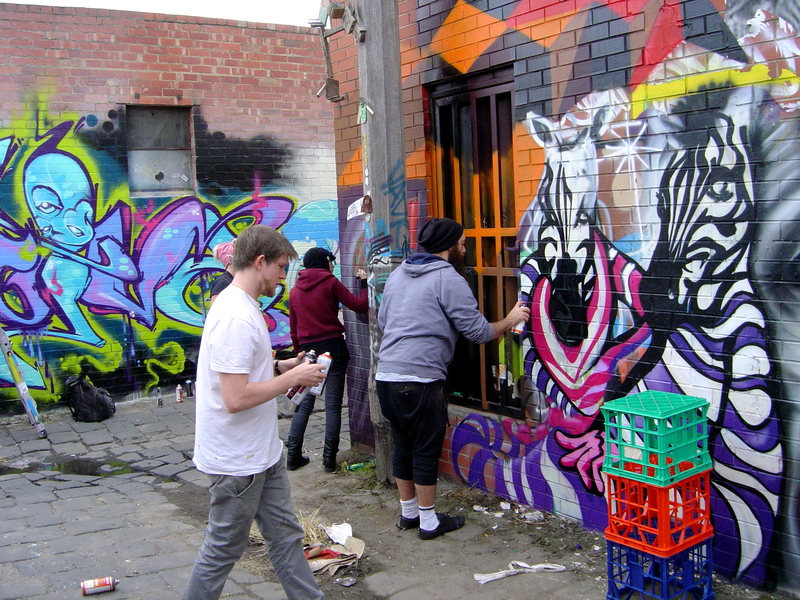 I’ve used the word ‘technical’, rather than ‘experimental’ because there aren’t that many experimental artists, in Galenson’s terms, on Melbourne’s streets, most are content to become technically proficient, although Slicer, Reka, Conrad Bizjak and others might count as experimental. Aside from the conceptual versus the technical there is a contrast in the ideological purity of CDH’s position opposed to the pragmatic concerns of E.L.K. The utopian ambitions of the politics of conceptual artists have often caused them to cry: “sell out” (in various ways, like all the “expulsions” from the official Surrealist movement). This usually been countered with accusations of lack of talent or technique but this doesn’t address the real differences between the two radically different approaches to art. The conceptual artist is not interested in the technique but the politics or philosophy of artistic progress and likewise the technical artist pragmatic has little time or interest in philosophy or politics. Specifically in reply to CDH’s article I would argue that street art is not held back or corrupted by its commodification because that was happening since the beginning of street art; Fab 5 Freddy was exhibiting in galleries in 1979, it is part of the street art system. 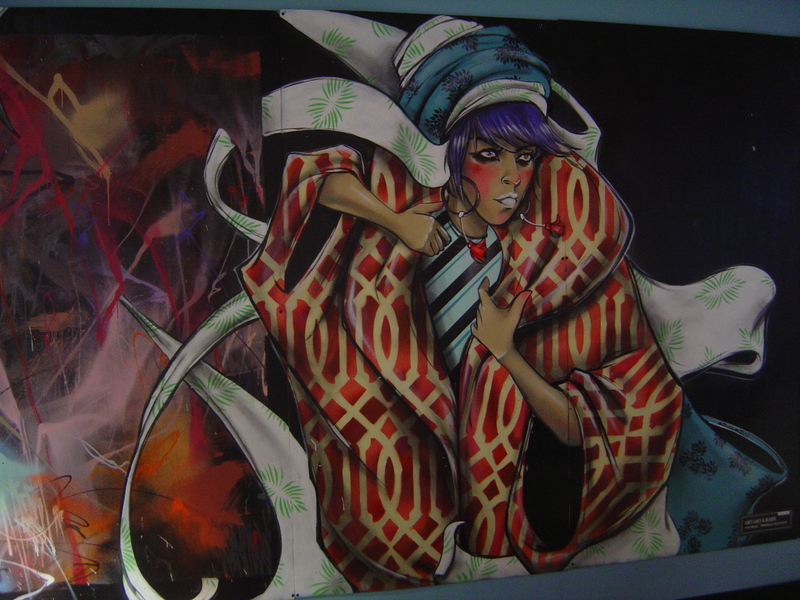 Nor is being distorted when graffiti goes mainstream that was also happening since the beginning, appearing in pop music videos like Blondie’s “Rapture” (1981) and the 1983 PBS documentary, Style Wars, for example. In Glenn Adamson and Jane Pavitt’s introductory essay “Postmodernism: Style and Subversion” the authors examine Alvin Toffler’s mainstream absorption model where “the potential disruptive energies of the subculture are controlled, and the hegemony of mass culture is continually reasserted” and provide a counter example, hip hop, where “the process of mediation and commoditization were factored in all along”. (Postmodernism: Style and Subversion, ed. Glenn Adamson and Jane Pavitt, V&A Publisher, 2011, p.53) To put it bluntly not all subcultures have the same relationship to mass culture as hippies or punks. Finally, I have no aesthetic or political opinion on the matter for without conceptual artists there will be little or no innovations or developments in street art but without the technical artists there wouldn’t be as large an audience or the interest. 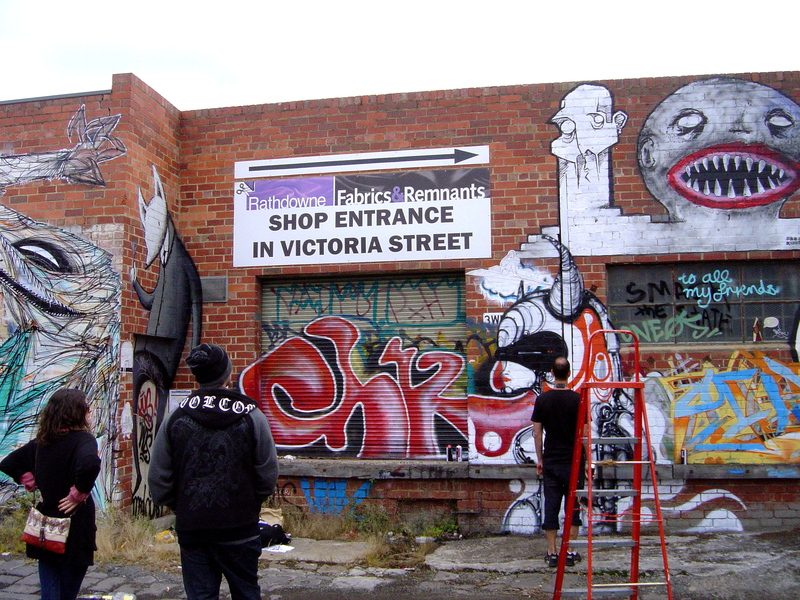 What I think is holding Melbourne’s street art back is the conservative traditionalists in street art and graffiti that believe that they can enforce their various definitions; in this respect they have a similar attitude to their traditional opponents, the police, railway security and city councillors. A year or so ago the AWOL crew were just another notable crew and then their pieces moved up to a whole new level of art and beauty. That is the AWOL crew in Melbourne, Australia, not the one in Boston, Massachusetts, nor the one in Lebanon. I first notice the work of the AWOL crew back in 2008. I’d appreciate the work of the AWOL crew around Brunswick but I don’t think that it was anything special. 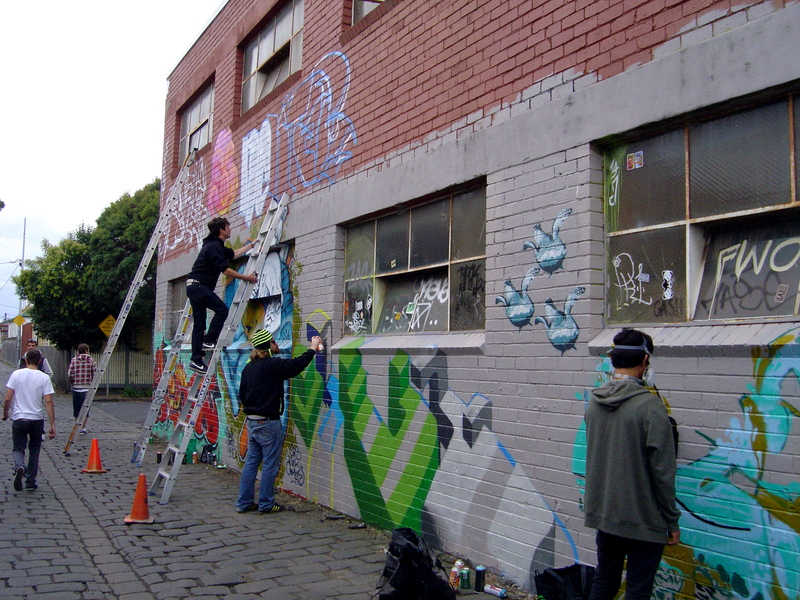 They were always over shadowed, even in the NGV studio space in early 2011 by the earlier and more popular Everfresh crew. 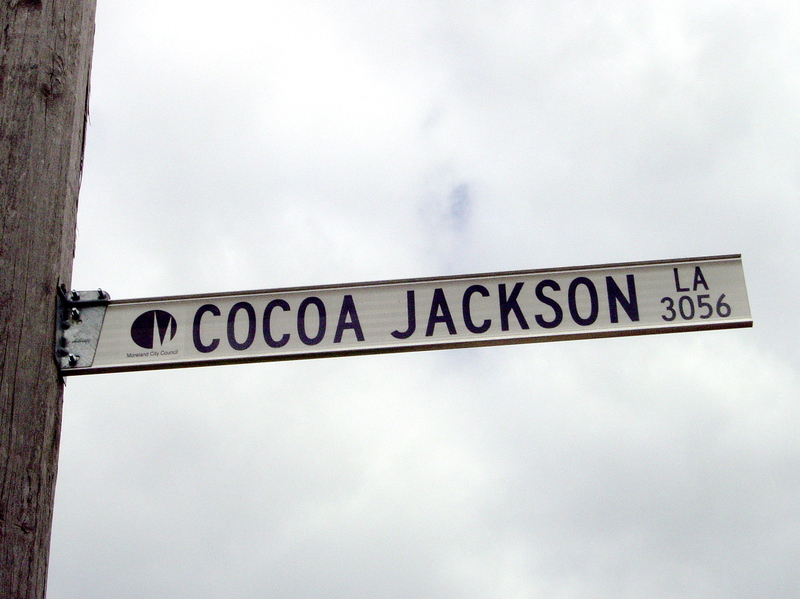 But even then they were showing elements that would soon burst onto Melbourne’s walls. I admire the growth and resilience of the AWOL crew; growth is something that I expect from all artists but resilience is a special quality and this is a crew that keeps on coming back stronger than ever. In 2010 I wrote about how they came back after a piece of theirs was vandalized at Brunswick Station. I appreciate the cooperative and collaborative work of graffiti crews often more for the politics than the results. Sometimes it is just amazing that the aesthetic mish-mash of styles and images holds together at all; often only an agreed colour scheme is all that holds them together. 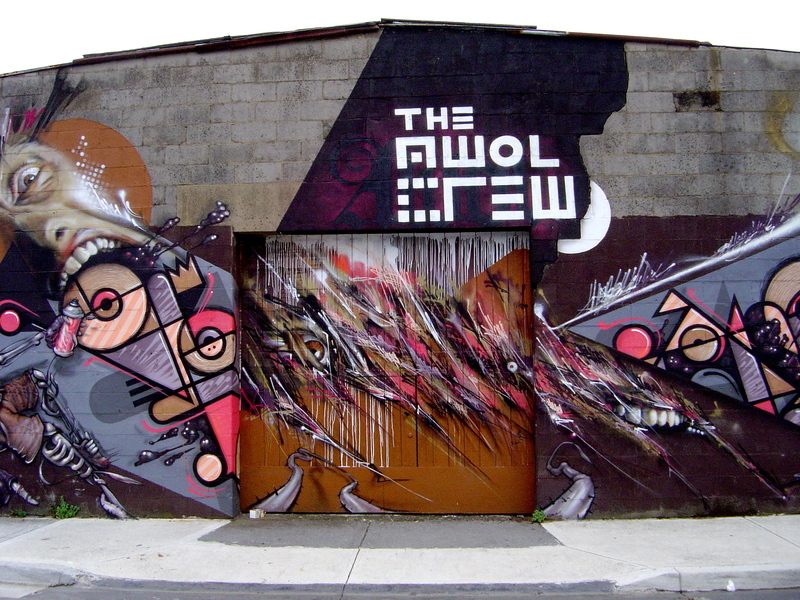 The AWOL crew are: Adnate, Slicer, Deams, Lucy Lucy, Itch and Li-Hill. Taken individually the members of the AWOL crew are not fantastic artists. They are competent, good, and occasionally brilliant certainly but nothing special; there are lots of people who do that sort of stuff. But working in combination lately the AWOL crew have been fantastic. Each member of the crew is pursuing their own style, following their own creative path, and yet it all beautifully comes together. Slicer does his best work in the crew, his dynamic sharp lines, very thin, controlled freestyle that ties the compositions together, like an electric guitar solo frozen in synesthesic paint. It is an almost impossible combination of styles like a mix of free jazz, classical, and trance techno. But then mixing and aerosol graffiti are two of the four elements of hip-hop. The compositions are like film posters featuring a dynamic montage of image, typography and a large face, except that instead of the face of a star it is an unfamiliar face. 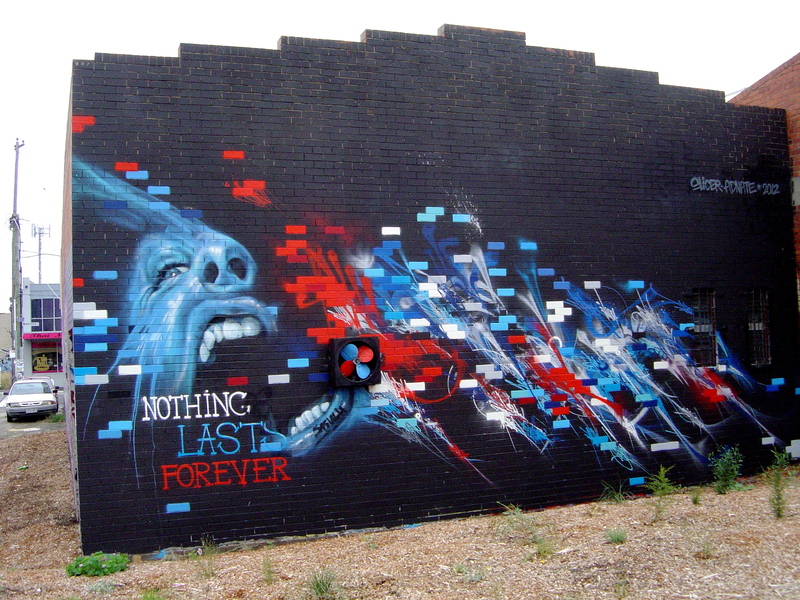 Is it the combination of Adnate and Slicer? Or is that Adnate moved away from letterform graffiti to painting faces. Is it a new approach to composition of whole walls? 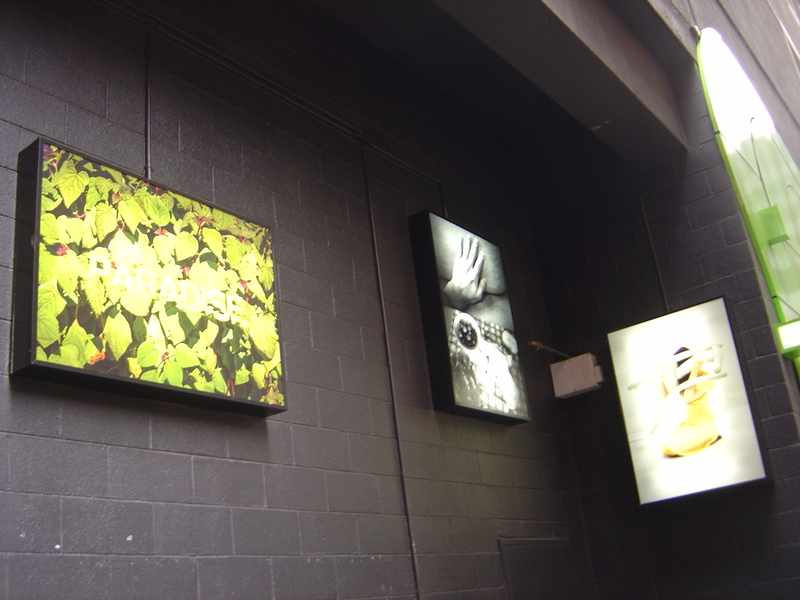 Is it exhibiting at Rist and other galleries? I don’t know, attempts to discuss this with the crew came to nothing, maybe they don’t know themselves; what ever it is the AWOL has evolved and taken Melbourne street art to a new level of beauty, style and composition.